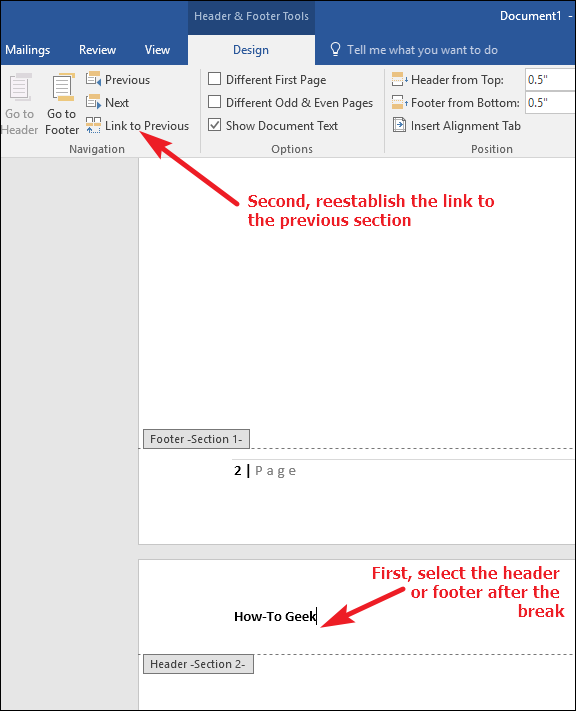 Word features a few built-in ways to change up your headers and footers in a document. For example, you can pretty easily have different headers and footers for odd and even pages, or you can have a different header and footer on the first page. To go beyond that, you’ll need to create multiple sections in your document, and learn how to link and unlink headers and footers from the preceding section. 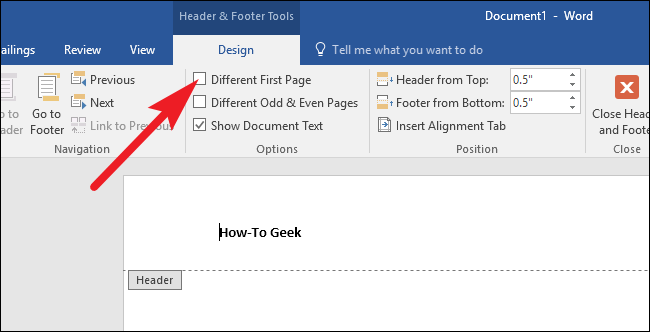 For demonstration purposes, we’ve created a simple document that uses a plain text header with the words “How-To Geek” and a plain text footer with a page number (like in the image at the top of the article). Note: We’re using Word 2016 for our examples in this article, but the techniques we’re talking about apply to pretty much any version of Word. One typical document convention is having a different header and footer on the first page of a document than shows up in the rest of the document. Perhaps you have a title page where you want no header or footer at all. Or, perhaps you want the first page footer to show some official disclaimer text for your company, and the footer in the rest of the document to show page numbers. Whatever your reason, Word makes this easy. First, double-click anywhere in either the header or footer region of a page to make those regions active. The header/footer region becomes active and you’ll see a new “Design” tab show up on your Ribbon with controls for dealing with headers and footers. On that tab, select the “Different First Page” option. When you select that option, any text already in the header and footer on the first page is deleted. Also note that the name of the areas on the first page change to “First Page Header” and “First Page Footer.” You can leave them blank, or you can fill the spaces with other text that will not impact the headers and footers on subsequent pages at all. Word also has a built-in option for creating different headers and footers for odd and even pages. By far, the most common use of this feature is to have page numbers appear at the outer edges of facing pages—the way you see it done in most books. To do this, double-click anywhere in either the header or footer region of a page to make those regions active. The header/footer region becomes active and you’ll see a new “Design” tab show up on your Ribbon with controls for dealing with headers and footers. On that tab, select the “Different Odd & Even Pages” option. When you select that option, anything you have in the footers of even numbered pages is deleted. You can then put anything you want there, and align it however you like. You have some graphics or spreadsheets in your document that you want on landscape-oriented pages, when the rest of the document is portrait-oriented. You still want the headers and footers at the vertical top and bottom of the pages, though. You’re creating a long document with multiple chapters and don’t want headers and footers (or want them to look different) on the title pages of each chapter. You want to number some pages differently. 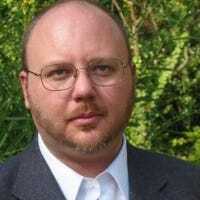 For example, maybe you want your introduction and table of contents pages numbered with Roman numerals, but the main text of your document numbered with Arabic numerals. Whatever your reasons, the trick is to create different sections where you want the headers and footers to look different. Personally, I find it easiest to think about the document ahead of time and create all the sections I need before I start populating the document. This often prevents the weird layout glitches you can get (and then have to resolve) when sectioning an already full document. That said, you can still create sections in an existing document, and the process is the same. 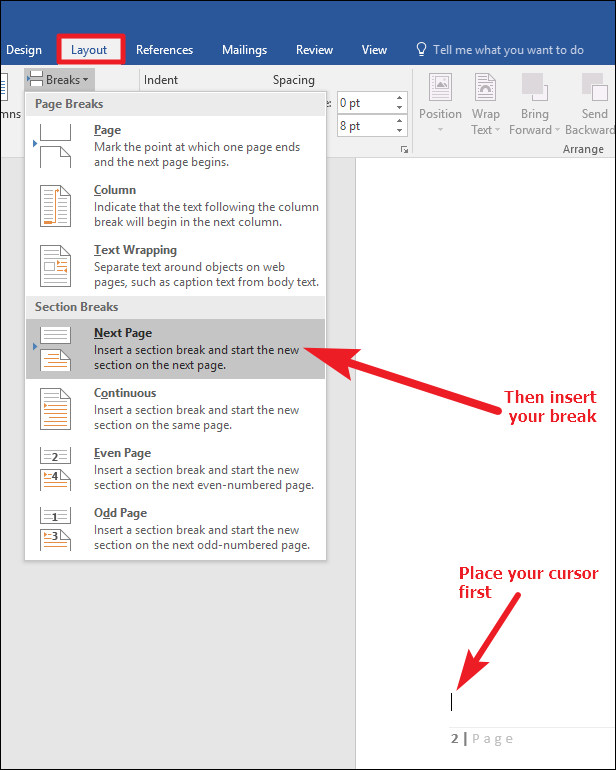 Place your cursor wherever you want to create a section break (typically this will be at the end of a page), and then switch to the “Layout” tab on the Ribbon. Click the “Breaks” button, and then choose the type of break you want. Usually, this is going to be a page break, so that’s what we’re using here. Now, double-click the header or footer area on the page after the break you inserted. On the “Design” tab of the Ribbon, click the “Link to Previous” button to turn that option off. This breaks the link between the header or footer (whatever you have selected) of this section and the previous section. If you want to break the link for both the header and footer, you’ll need to do each one in turn this way. Unlinking does not delete any existing text or images in the header or footer. You can remove, modify, or replace what’s already in your header or footer, and your changes will not impact the headers and footers in the previous section. If you decide to reestablish a link to a previous sections header or footer, though, that action is destructive. When you relink sections, the header and footer in the active section is removed and replaced with whatever’s in the previous section. To do it, just double-click the header or footer on the page after the break. On the “Design” tab of the Ribbon, click the “Link to Previous” button to turn that option back on. 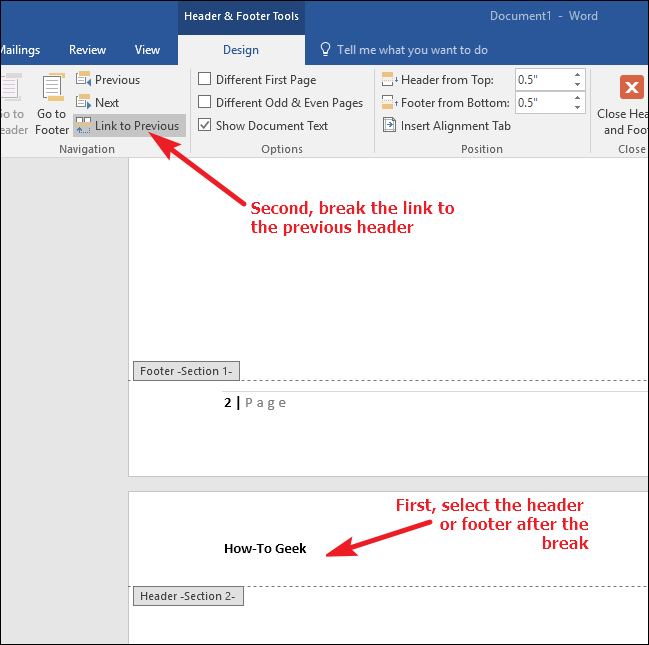 Word warns you that you’ll be deleting the current header or footer, and replacing it with the header or footer from the previous section. Click “Yes” to make it happen. And just like that, your header or footer is reconnected to the previous section. Just remember that you’ll have to link or unlink both the header and footer as separate actions.